Scrappy Little Nobody is a collection of essays by Anna Kendrick. The topics range from early childhood recollections, life as a penniless actor, and Hollywood stardom. I'm usually not big on celebrity memoirs, but I thought I'd give this one a shot since I enjoyed some of her movies. I think the first movie I saw her in was Twilight. However, the movie that made me a fan was Pitch Perfect. I didn't really know much about Kendrick's life before listening to this audiobook. I had no idea she was a child actor or that she performed on Broadway. She even won a Tony. As you can tell, I was totally in the dark as far as Anna Kendrick was concerned. Kendrick is the narrator of her book and she does a superb job. It has a casual tone that makes you feel like it's just the two of you in a conversation. Scrappy Little Nobody has the same edgy snarkiness that Kendrick's characters often portray in movies. I often wondered if it's her actual personality or if she's giving the people what they want--so to speak. But despite my misgivings, the audiobook was interesting and entertaining. It does feel as if she's being mostly honest with her readers. She doesn't gloss over the bumpy road to stardom or make it sound easy. 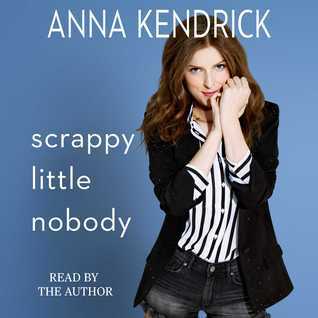 Scrappy Little Nobody is must for Anna Kendrick fans who want to get to know her better. *Disclosure: This post contains an affiliate link to Amazon.I received this audiobook from Simon and Schuster Audio in exchange for a fair review. The opinions expressed here are my own.